Who’s Who in the Metal Miltia. Heroes of the Day: Acknowledgments. DISC 1 ON THROUGH THE NEVER. 1. Whisper Things Into My Brain: Metallica, Emotion, and Morality. 2. This Search Goes On: Christian, Warrior, Buddhist. 3. Alcoholica: When Sweet Amber Becomes the Master of Puppets. 4. Through the Mist and the Madness: Metallica’s Message of Nonconformity, Individuality, and Truth. DISC 2 EXISTENSICA: METALLICA MEETS EXISTENTIALISM. 5. The Metal Militia and the Existentialists’ Club. 6. The Struggle Within: Hetfield, Kierkegaard, and the Pursuit of Authenticity. 7. 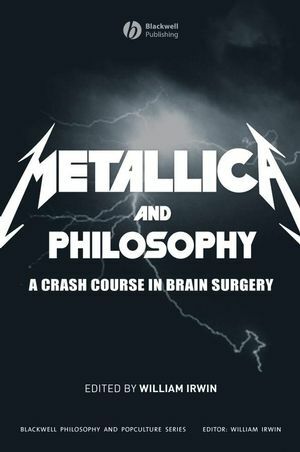 Metallica, Nietzsche, and Marx: The Immorality of Morality. 8. Metallica’s Existential Freedom: From We to I and Back Again. DISC 3 LIVING AND DYING, LAUGHING AND CRYING. 9. To Live is to Die: Metallica and the Meaning of Life. 10. Madness in the Mirror of Reason: Metallica and Foucault on Insanity and Confinement. 11. Ride the Lightning: Why Not Execute Killers?. 12. Living and Dying as One: Suffering and the Ethics of Euthanasia. 13. Fade to Black: Absurdity, Suicide, and the Downward Spiral. Justin Donhauser and Kimberly A. Blessing. DISC 4 METAPHYSICA, EPISTEMOLOGICA, METALLICA. 14. Believer, Deceiver: Metallica, Perception, and Reality. 15. Trapped in Myself: “One” and the Mind-Body Problem. 16. Is It Still Metallica? On the Identity of Rock Bands Over Time. Manuel Bremer and Daniel Cohnitz. DISC 5 FANS AND THE BAND. 17. Metallica Drops a Load: What Do Bands and Fans Owe Each Other?. 18. The Unsocial Sociability of Humans and Metal Gods. 19. Boys Interrupted: The Drama of Male Bonding in Some Kind of Monster. 20. Justice for All? Metallica’s Argument Against Napster and Internet File Sharing. "Intellectual snobs and proud low-brows alike may dismiss this as a joke- though obviously not respected academic publishers Blackwell ... as an introduction to some of the major schools of thought, it is no less worthy than popular books like Sophie's World that have also sought to bring philosophy to the mass market."